Much to his horror, The Count of Flanders’ first child is born female. Marguerite of Male’s existence seems to defy her lovely mother’s assurances that her child has been born “for love, good fortune, and happiness,” and from even before her harrowing birth she must draw upon all her strength to fight for her own life in this historical fiction tale. Despite her wishes to be as beautiful and elegant as her mother, Marguerite has a fiery streak and a headstrong nature that completely breaks the stereotypes and conventions everyone, including her ruthless father, holds her to. Her mother is eventually sent away to help cure her own madness after another miscarriage, and the Count’s bitterness toward Marguerite is fueled. With her as his only heir, he sees his daughter only as a political tool to carry on the power and land he has amassed, with no regard to her wishes or happiness. Facing the intense pressures of war, arranged marriages, and the deathly plague, Marguerite must use all her cunning and will to try to make a life of happiness, and eventually comes out of her darkest time ready to take on life in her own way. 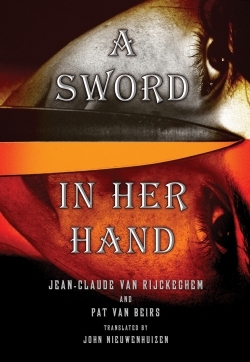 Authors Jean-Claude Van Rijckechem and Pat van Beirs won a screenwriting award at the Cannes Film Festival for their screenplay Moscow-Belgium; here they have teamed with translator John Nieuwenhuizen to create an engaging, well-paced story that also gives a vivid picture of life in the Middle Ages. While the plot and characters alone make an intense read for teens, the well-developed setting rounds out the novel. Their research plays out wonderfully in a recreated world where readers are given glimpses into everything from the intensely religious superstitions so prevalent in the society to the violent jousting tournaments. Based loosely on the real Marguerite of Male, Marguerite is sharp and smart, and her emotional range makes her completely engaging and quite likable. Her antics and gumption add a bit of humor to the drama and intrigue of the story, and her journey as she grows into the Countess of Flanders makes for a great read for readers of all genres, but especially those who gravitate towards historical fiction.